Ahh, spring is here and it’s time to put those sweaters away. Or is it? Maybe it’s seen it’s better days. Or your weight has changed, and it doesn’t fit like it used to. Or you’re just itching to go thrifting and engage in some Earth Day craftiness. It really looks like this would be a do-able project for beginning sewers… the toughest part is making the collar template, since she doesn’t provide a pattern. But don’t be afraid… you could make a tracing of a collar you already have. (Here’s a little help for drafting a collar pattern, too.) Or, if you’re not ready, just skip the collar altogether. There’s no doubt that recycling/refashioning clothes is a hot trend right now – and with Earth Day approaching, give it a shot and earn yourself some bragging rights! 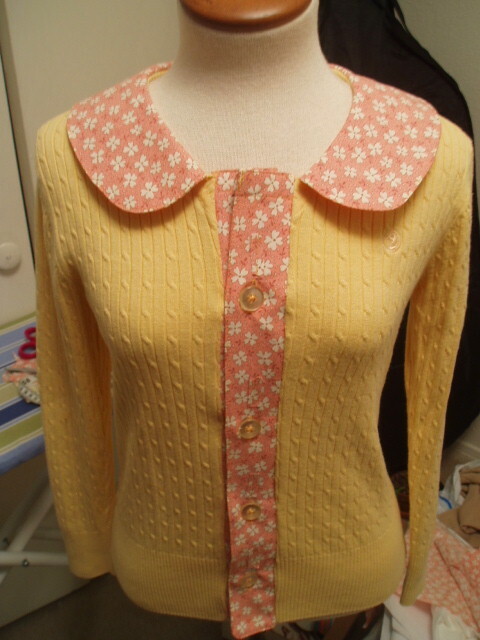 PS… Fellow crafty blogger Woof Nanny sent me a link to this photo, of her repurposed sweater. She added the cool zips. Funky! Hi Jenny. I just got tagged, so now I’m tagging you. http://flickr.com/photos/barbian7/606002071/ (if you can’t see the image, you may have to sign up on flickr. It’s free. It’s a photo-sharing site, and it’s how I upload photos to my blog). You have some really good ideas here. Thanks for commenting on my blog.